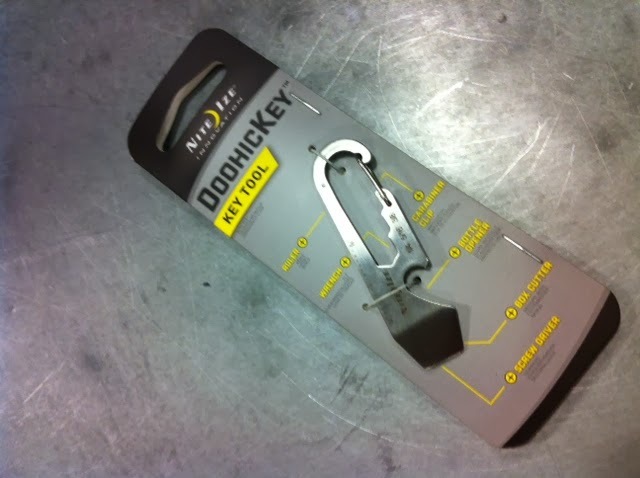 Doohickey - multi-tool as seen at West Marine. There really is a product called a “doohickey” that’s not a euphemism; we sold them at West Marine. While not “the” doohickey, for the unenlightened, what is a doohickey? a thing (used in a vague way to refer to something whose name one cannot recall). What does this doohickey do? If there’s truth to the adage “What separates men from boys is the size of their toys,” Niteize’s DoohicKey (click here to link to their website) is more a plaything then a real multi-tool, more a Boy Scout swiss army knife than a Leatherman (click here if you don’t know what a Leatherman is). A box cutter, bottle opener, wrench, ruler, and flat head screw driver with a sturdy carabiner clip all-in-one, at just a smidge over 2 ½.” It is kinda cool. It exudes a certain MacGyver-ish (click if you’re not sure who MacGyver is) cachet, clever although not quite something Q (click here if you’re not sure who Q is) would hatch up to save the day for James Bond, aka 007 (Bond fans, click here). I might’ve opted for different name. Would you? Would you buy a Doohickey?